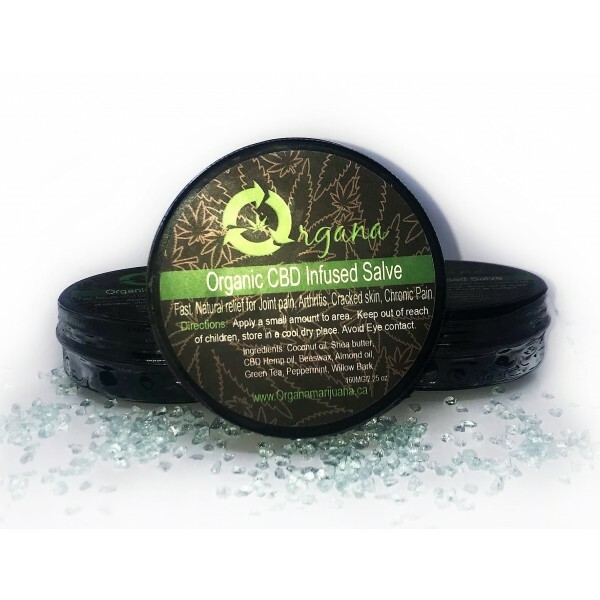 This Salve has a high CBD content to provide fast, Natural relief for joint pain, arthritis, cracked skin and chronic pain. Has more of an earthy scent. Great for targeted pain areas. Ingredients: Organic coconut oil, Organic shea butter, CBD hemp oil, Organic beeswax, almond oil, green tea, peppermint, willow bark. Apply as needed to the desired area. This Salve has a high CBD content to provide fast, Natural relief for joint pain, arthritis, cracked skin and chronic pain. CBD Infused Salve (160mg CBD) - 2.25oz container Has more of an earthy scent. Great for targeted pain areas. Ingredients: Organic coconut oil, Organic shea butter, CBD hemp oil, Organic beeswax, almond oil, green tea, peppermint, willow bark. CBD - Anti-inflammatory, Anti-depressant, Anticonvulsant, Antipsychotic, Anti-tumoral, Anti-cancer, Antioxidant, Antiemetic, Analgesic, Anxiolytic Apply as needed to the desired area.